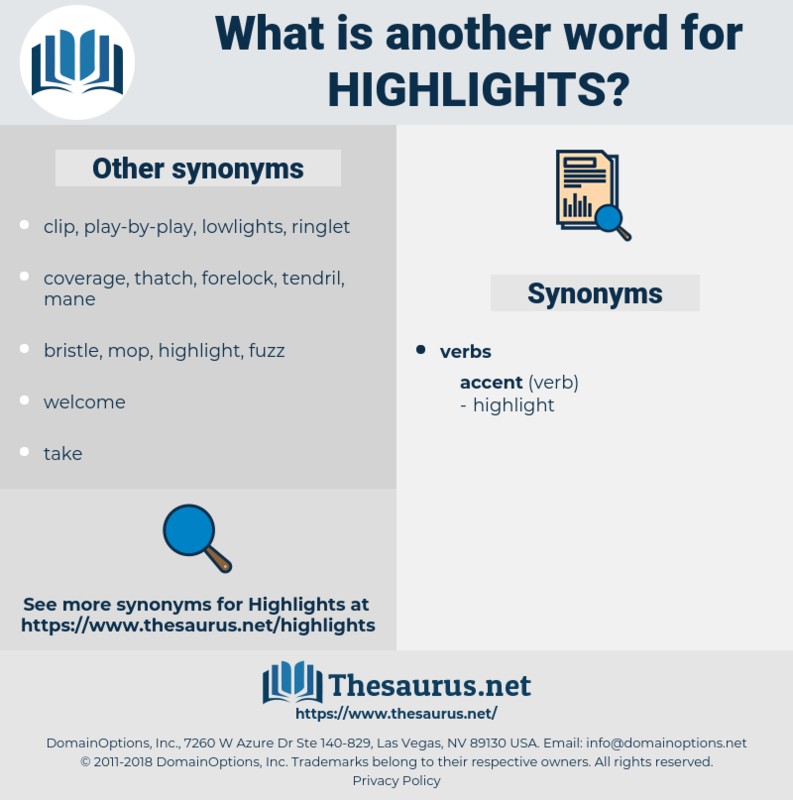 What is another word for highlights? insights, Achievements, findings, milestones, priorities, features. points, focusing, commemorates, milestones, essential, Celebrities, synthesizing, featuring, significant, perspective, elements, focused, priorities, general, recent, features, featured, headings, overviews, item, synthetic, vitality, consolidated, largest, consolidation, preview, strengths, keynote, synthesis, contents, chief, digest, eminent, synopsis, brief, chat, leading, commends, observe, sheet, star, stars, facts, condition, master, wrap-up, abridged, welcomes, events, briefs, roll-up, Summaries, says, extract, quick, vigor, concise, comments, sampler, browse, sommaire, lead, dynamic, abstract, abstracts, background, senior, crown, MEPS, scan, galaxy, score, survey, state, states, view, ", parent, point. 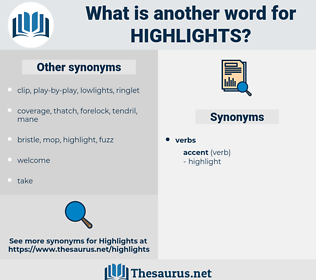 Lights, insights, reiterates, showcases, underscores, characteristics, accomplishments, overflights, notes, particulars, factors, themes, essentials, Emphases, emphasises, acknowledges, Particularities, presentations, attributes, considerations, perspectives, cornerstones, attractions, glimpses, objectives, summarizes, specifics, topics, Keys, introduces, exhibits, reaffirms, stimulates, affirms, profiles, Peculiarities, motivates, targets, crosshairs, updates, ingredients, displays, summarized, submits, headlines, tips, aspects, presents, fundamentals, Guidelines, parts, report, Incentives, pillars, principals, Goals, Achievements, thrusts, specifications, Clips, Syntheses, insists, nouvelles, lignes, draws, findings, traits, rubrics, contours, discusses, shows, incites, dots, sheets, encourages, specificities, Categories, clusters, beats, portions, outcomes, routes, sections, influence, influences, large, trends, moments, Records, failures, parameters, documents, excerpts, balance, east, extracts, analysis, Analyses, pieces, acts, FORTS, directions, headlamps, puts, citations, deals, Entries, calls, devices, leads, offers, places, papers, outputs, programmes, results, successes, sets, programme, rows, projects, columns, performances, developments, memorandum, lamps, fires, provides, passages, news, Programs, Properties, songs, 2003, points, milestones, essential, elements, LINEs, priorities, makes, features, headings, overviews, strengths, contents, digest, facts, events, briefs, Summaries, extract, comments, abstract, abstracts, scan, Focuses, Foci. light, lighting, characteristic, characteristics, cornerstone, flavour, gist, reflection, indication, mainstay, summarise, posting, foremost, bulletin, pillar, briefing, guideline, best, mainstream, better, blueprint, fruit, material, excellence, programming, specialty, taste, essence, sketch, reality, character, portrait, editor, status, bulk, basic, look, predicate, programme, plank, root, sum, result, index, memorandum, substance, dawn, program, significant, general, preview, keynote, chief, synopsis, brief, star, condition, master, stress, lead, abstract, climax, scan, state, parent, salient, point, height, Focuses, Foci, underlining, emphasis, milestone, pinnacle. pointed, underscored, stressed, noted, outlined. Celebrating, underscoring, pointing, Acknowledging, Noting, stressing, Outlining, Recognizing, marking, contributing, Placing, briefing, Stating, focusing, ". light, spotlights, illustrates, enlightens, hints, heightens, distinguishes, hits, cites, mentions, demonstrates, illuminates, delineates, strengthens, depicts, note, details, suggests, testifies, incorporates, differentiates, publicizes, indicates, accentuates, reminds, typifies, tells, where, portrays, clarifies, exists, identify, identifies, articulates, alleges, explains, focusses, concentrates, reflects, signifies, reveals, summarizing, explores, annotations, exemplifies, confirms, reinforces, descriptions, informs, prioritises, attaches, involves, summarises, signals, prioritizes, entails, recognises, promotes, criticises, helps, relates, aims, exposes, tackles, list, lists, shines, denotes, evokes, conveys, Addresses, describes, assigns, stipulates, brings, attracts, values, implements, devotes, implies, restates, defines, invites, allocates, lifts, facilitates, writes, enhances, unveils, fosters, asserts, enumerates, concludes, represents, examines, contains, establishes, repeats, attest, attests, teaches, determines, specifies, threatens, appreciates, clearly, captures, connotes, reports, honours, reiterates, belongs, augments, quotes, elaborates, transpires, advocates, urges, warns, deepens, inspires, proves, exacerbates, realises, Recalls, enshrines, consists, showcases, discloses, hosts, refers, conceals, cautions, includes, underscores, translates, lies, Lives, Manifests, improves, delivers, contends, realizes, deplores, combines, opens, encompasses, mirrors, dictates, underpins, advises, re-emphasizes, observes, Upon, endorses, administers, complains, throws, traces, contributes, Gives, condemns, pinpoints, move, moves, description, enables, emerges, initiates, widens, excels, comprises, prompts, treats, review, reviews, notes, argues, Leaves, underlies, separates, factors, supports, maintains, betrays, pays, dwells, proposes, wishes, denounces, Affects, formulates, persists, builds, adds, acknowledges, understands, turns, expands, handles, lays, occurs, works, poses, Tracks, expounds, imposes, shares, serves, claims, reproduces, expresses, Grants, Permits, holds, concerns, assures, extends, sends, communicates, looks, suffers, considers, arises, foresees, attributes, accent, Comes, enforces, allows, Bears, renders, uses, adopts, depends, place, favours, creates, goes, summarizes, undertakes, finds, stands, Keys, Strikes, introduces, recounts, covers, exhibits, develops, reaffirms, remembers, rejects, stimulates, appears, on, therefore, operates, speaks, continues, increases, affirms, talks, casts, awards, induces, believes, Plays, seems, becomes, raises, seeks, Exercises, produces, motivates, applies, Rests, Has, Carries, falls, patent, resumes, happens, displays, respects, conducts, structures, submits, takes, aspects, presents, begs, accords, asks, insists, approaches, draws, processes, discusses, shows, incites, encourages, runs, means, reads, accounts, compounds, moments, Does, acts, FORTS, puts, deals, calls, leads, sheds, offers, places, basic, sets, provides, points, commemorates, elements, priorities, makes, features, strengths, commends, facts, says, stress, abstract, states, Focuses. stress, point, recognize, mark, draw, repeat.